When travelling with a pet there are items that if used will make your pet’s journey more comfortable and also be handy in case of emergencies. 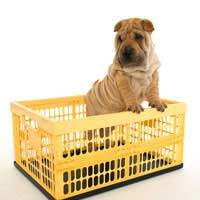 If your pet is to be a regular traveller in your car then a cage or crate should be installed in the vehicle. The cage should be secured so that it does not move during the journey. It has been known for dogs in cages to survive car accidents where the car has rolled over and they walk away without a scratch afterwards. Being caged will also mean that they are safe and content with their own space during the journey. A small bag containing a few cleaning items would be very handy for pet owners. Paper kitchen towels have a multitude of uses from cleaning up a sick animal, cleaning the upholstery after an accident or even drying your own hands after handling a pet. Plastic bags can be used to put waste in after cleaning up your pet and also as poo bags when walking a dog. A spray cleaning fluid or even water in which to clean any part of the vehicle that becomes soiled. Remember that a highly scented spray can be overwhelming in a small vehicle. I have a pet travelling with me (name breed or type of pet). I have pets at home, Please contact the following person who has a key. With a little thought you can be ready for any eventuality when travelling with a pet.